Cube in rockwool for your cuttings / clones. Extra big cubes where you can root or grow your seeds. First place them in a plug, thereafter transfer them to the cubes for replanting. GRODAN Delta forms the foundation for uniform and perfectly controllable propagation of plants – an absolute condition for vigorous and healthy plant growth. Each block has an identical density, flexibility and sturdiness, guaranteeing even distribution of the WC, EC and pH. The result is a uniform and high-quality plant. 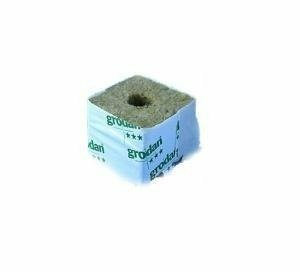 GRODAN Delta is the best block for essential properties such as firmness and saturation. These qualities make GRODAN Delta ideally suited for propagators who want to secure the success of their processes. GRODAN Delta is a widely used block for propagating tomatoes, sweet peppers and cucumbers worldwide. The easy water and EC distribution, handling and saturation offer propagators a reliable start to production.